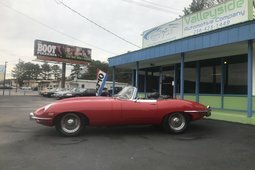 If you’re on this site, you must know you’re looking at an E-Type. It is a superstar among both car aficionados and average Joes alike. It has been voted the most beautiful car in the world on numerous occasions and appeared as a token of style and wealth everywhere from Austin Powers to Mad Men. Due to this iconic status, it is unforgivable for a car buff to not know the key facts about this sleek cat. Please, allow us to fill you in. By 1960s, it was a high time for Jaguar to find a replacement for their aging XK150 while, company’s racing division excelled at Le Mans with the brilliant D-Type. Not to waste the racing expertise, Jaguar drew from their motorsport know-how when developing the E-Type. This is where the iconic Jaguar got its aerodynamic monocoque body, 3.8 l straight-6, four-wheel disc brakes and independent suspension. That was cutting edge technology and the car was bound to make a splash. But even Jaguar’s founder Sir William Lyons did not anticipate how much of a splash this would be when the car was revealed in Geneva motor show in 1961. The crowds could not get enough of the E-Type, so Lyons ordered Jaguar’s driver Norman Dewis to get the second car down to Switzerland for the following day. He managed to cover more than 1000 km between Coventry and Geneva in under 11 hours heroically driving the roadster through the night. You see, it was not only the E-Types gorgeous body, race car chassis or 240 km/h top speed that was drawing the crowds. The price was alluring as well. 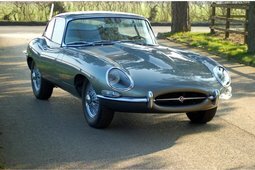 Not only was the E-Type more affordable than the XK150 it replaced but comparable Aston Martins and Ferraris cost two or three times more. To an untrained eye, all E-Types look the same. And while the swooping and sleek shape did remain throughout the model’s 14 year run, it did undergo quite a few changes. 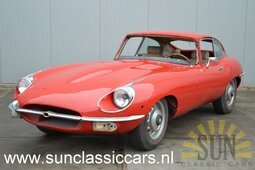 E-Types are generally classified into Series I, II and III. It must be mentioned that due to the hand-built nature of these Jags, not all of the alterations happened at once, thus there are transitional models sharing features of different series. As you might have guessed, Series I was the original model and can be externally distinguished by its smaller front opening, covered headlights and tail lights above the rear bumper. In 1964 its engine was enlarged to 4.2 liters, granting more torque. Being a racecar at heart, the E-Type was a common sight on the track, used by the automaker itself and privateers. Several versions took the racing theme a few steps further. The first one was the Low Drag Coupe. 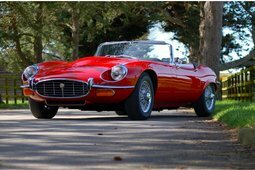 Just like the name suggests it was exercise in aerodynamics and sported a sleeker and lower body, aluminum panels and a spicier version of the 3.8 l. The experimenting with lightweight alloys continued and in a few years the world saw the E-Type Lighweight roadster. A true spiritual successor of the D-Type, it was quite successful when raced by private teams. Sure, racecars are thrilling, but it is the road cars that make the bottom line. 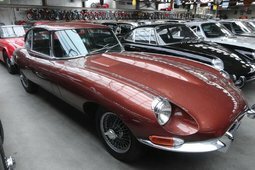 US market made up a lion’s share of E-Types production, so when the joy-killing 1960s legislations came into effect, Jag had to comply. The 1968 revised model was dubbed Series II, it had uncovered sealed beam headlights and repulsive safety bumpers. 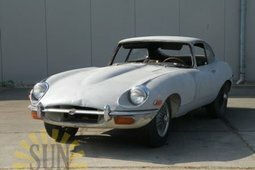 Disappointingly, these changes were applied to all of the E-Types, not only the ones sold across the pond. To meet the smog requirements, American cars also lost the triple SU carbs and, consequently, a chunk of power. Series II also came in an unconventional looking 2+2 coupe body style. It was a more comfortable and spacious variant, full 23 cm longer than the standard car. There was an additional row of seats, suitable for tiny humans, but it did take a toll on the cat’s sharp handling and that pretty Malcolm Sayer design. 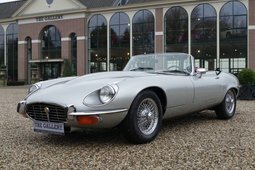 That is precisely the reason the 2+2 coupes are the least desirable among the collectors and are usually the cheapest ticket into the E-Type ownership club. Over time, E-Type shifted from its racecar origins and morphed into a GT. It became extremely evident when the Series III came around in 1971. It was fitted with Jaguar’s hefty, yet silky smooth 5.3 V12. It now had plushier interior and seats, something that the original lacked. The sporty 2-seater coupe was ditched and only roadsters and 2+2 coupes were offered from 1971 onwards. Cross-slated front grille and wider stance differentiated the exterior of these late cars. Series III were produced quite briefly as the E-Type production ended in 1974. Want to get one of your own? Well, tough luck. 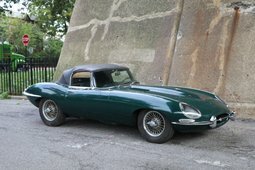 With classic car market skyrocketing, E-Types were among the top appreciating examples. If you want to get a decent one for less than EUR 100,000, you should probably look at an S3 coupe. While frowned upon by Jaguar snobs (and thus cheaper), these were as refined and as comfy as the E-Types got. 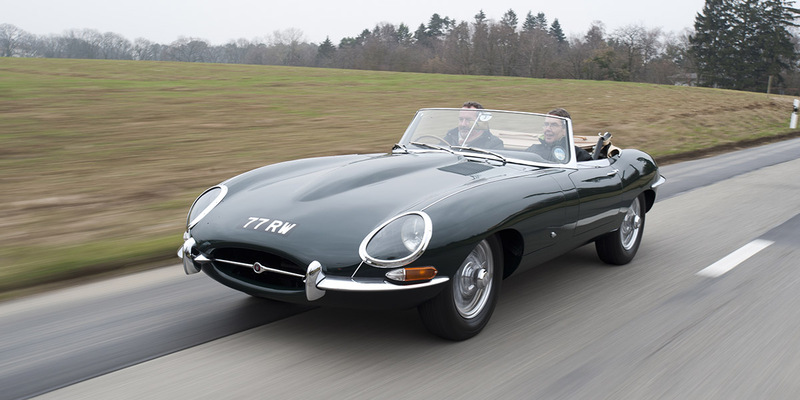 When it comes to the most exclusive E-Types, the sky is the limit and some go for millions.